Marcus Buckingham Hailed as a corporate visionary - launches his newest book “Find Your Strongest Life: What the Happiest and Most Successful Women Do Differently” Internationally renowned and celebrated, Marcus Buckingham is the go-to consultant in his field, a sought after speaker, and a New York Times bestselling author. Challenging accepted and entrenched social theory, Buckingham pioneered a revolutionary concept—that people will be dramatically more effective, successful, and fulfilled when they play to their strongest skills rather than attempting to improve their weaknesses. He calls his research-based technique the “strengths revolution,” and his work has been proven again and again in boardrooms, seminars, and individual’s lives around the world. 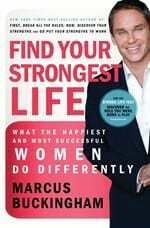 Join Marcus Buckingham on today’s program to learn more about how you can engage your best life now based on his groundbreaking workshop as featured on Oprah!